The Hyperdeck Studio - it's like a VTR, but quite simply it's just better. 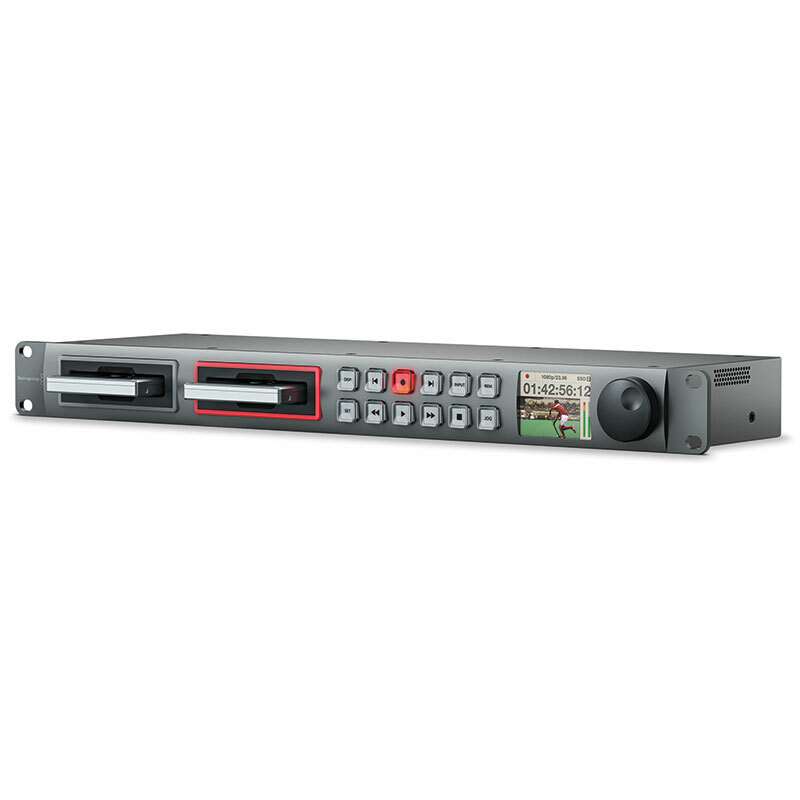 It's as reliable as a tape deck but gives you infinite recording, uncompressed recording, ProRes encoding or DNxHD recording. 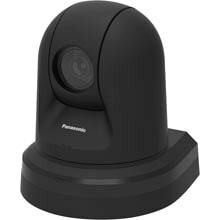 It's got everything a tapeless workflow needs for remote and local control and fits straight into any facility. The world's first SSD video recorder that lets you record forever! HyperDeck Studio features 3 Gb/s SDI and HDMI connections, familiar VTR controls including a jog/shuttle wheel and RS-422 control, LCD preview screen. Records and plays back SD/HD uncompressed, ProRes and DNxHD video. HyperDeck Studio has a familiar deck style user interface, removable SSD disks and serial control for a 21st century broadcast deck. The HyperDeck Studio disk recorders let you record the highest quality uncompressed and compressed ProRes and DNxHD video formats using fast 2.5" SSDs. Designed with familiar VTR controls, HyperDeck Studio includes innovative features that extend beyond the capabilities of traditional decks. Dual SSD slots let you record continuously, when one disk is full recording automatically continues on the next SSD. You can mount an SSD recorded using HyperDeck Studio on to any computer to access your files, so you don't need multiple decks to work with your media! There are two great HyperDeck Studio models to choose from. HyperDeck Studio is a fantastic modern replacement for aging broadcast decks. You get the same functionality and control of a professional deck with the advantage of recording directly to uncompressed or industry standard ProRes and DNxHD video formats. Connect cameras, switchers or any other video feed to HyperDeck Studio and create files that are perfect for every production and post production workflow! 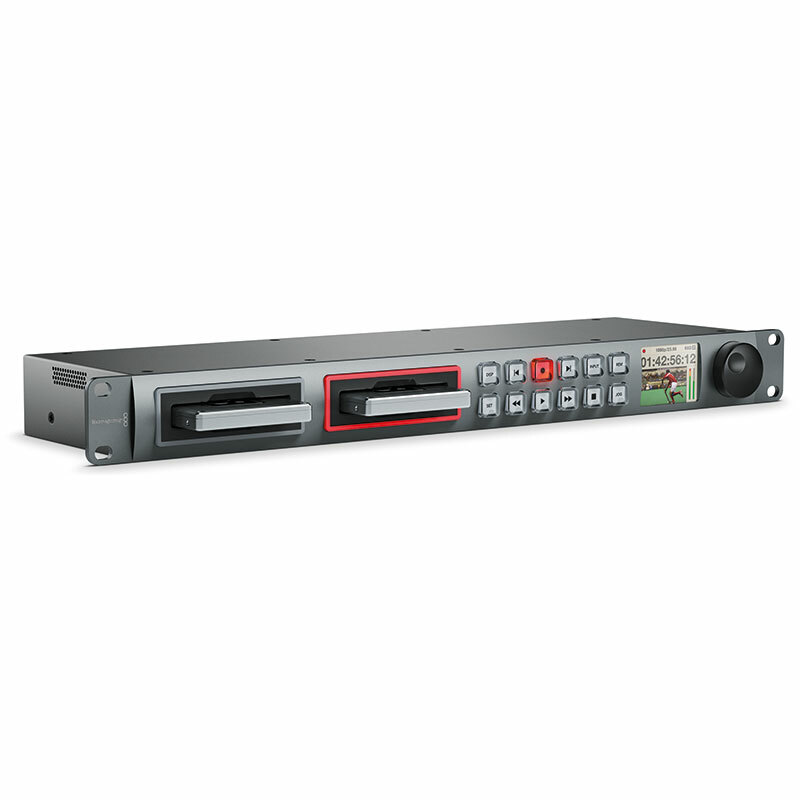 With a slim 1 rack unit design, HyperDeck Studio is considerably smaller than a traditional VTR and fits easily into any equipment rack, OB vehicle or flyway kit! 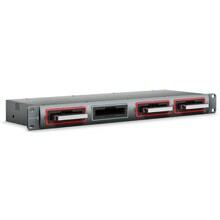 HyperDeck Studio records SD/HD 10-bit 4:2:2 uncompressed video for perfect broadcast quality. With uncompressed video you can create the sharpest VFX plates for match moving, compositing and more. 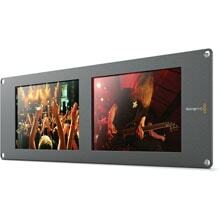 You get deep dynamic color range for color correction and perfect keying without jagged edges. You can also use industry standard compressed video formats that maintain incredible HD quality at reduced files sizes. With HyperDeck Studio Pro you can now push quality to new heights, with additional support for Ultra HD 4K using Apple ProRes. 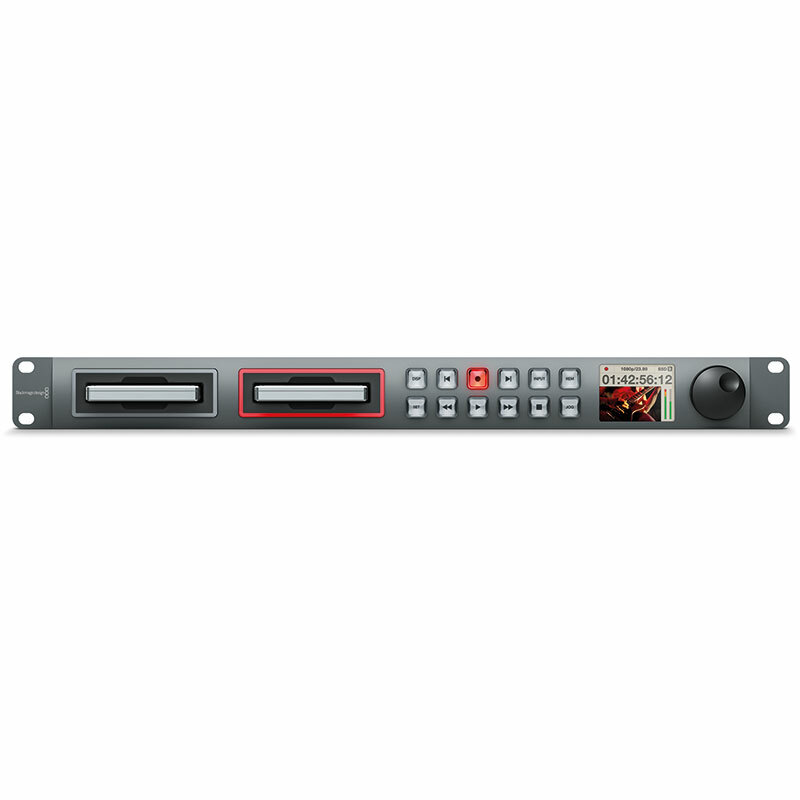 HyperDeck Studio models gives you the choice of recording quality! You can record and play back incredible uncompressed 10-bit 4:2:2, or choose from high quality ProRes 422 (HQ) or DNxHD formats. 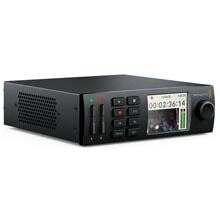 HyperDeck Studio Pro also has ProRes 422, ProRes 422 (LT) or ProRes 422 (Proxy)for longer recording. Using ProRes 422 (Proxy) you can record over 24 hours of 1080HD video on a single 480GB SSD drive! You could record for 2 days non stop before swapping SSD drives! HyperDeck Studio records universally compatible QuickTime files in 10-bit uncompressed or compressed DNxHD and ProRes formats so they can be used with all popular software packages, such as Final Cut Pro X, Adobe Premiere Pro CS6, After Effects CS6, Avid Media Composer 6, DaVinci Resolve and more. Customers will always be free to choose the editing, color correction and finishing tools that are best for their clients and jobs. SSDs which are qualified for Uncompressed 10-bit video capture will also work well for compressed video capture. There are some SSDs which we have tested and found to drop frames when capturing Uncompressed 10-bit video. However, they still work well when capturing compressed video. Some models of SSD can’t save video data at the speed the manufacturer claims. This is due to the disk using hidden data compression to attain higher write speeds. This data compression can only save data at the manufacturer’s claimed speed when storing data such as blank data or simple files. Video data includes video noise and pixels which are more random so compression will not help, therefore revealing the true speed of the disk. Some SSDs can have up to 50% lower write speed than the manufacturer’s claimed speed. So even though the disk specifications claim an SSD has speeds fast enough to handle video, in reality the disk isn’t fast enough when used to store video data for real time capture. However, this mostly affects HD capture and often these disks can still be used for playback. Use Blackmagic Disk Speed Test to accurately measure whether your SSD will be able to handle uncompressed video capture and playback. Blackmagic Disk Speed Test uses data to simulate the storage of video so you get results similar to what you’ll see when capturing video to a disk. During Blackmagic testing, we have found newer, larger models of SSD and larger capacity SSDs are generally faster. General performance and stability updates. 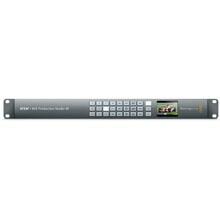 1 M/E production switcher with 8 inputs, DVE, 9 layers for Mac and PC.